Laguna Beach has long been a playground for America’s rich and famous. Incorporated in 1927, the city attracts over 6 million visitors a year who come to enjoy its year-round sunny weather, seven miles of gorgeous beaches and lively arts scene. The thousands of residents who call Laguna Beach home are treated to a resort lifestyle of sand, surf and nature adventures. Home to over 30 beaches along the beautiful Pacific Ocean coastline, the city also features stunning coves and cliffs, waterfront parks, top class shopping and dining, and the beautiful homes of some of the country’s most affluent denizens. 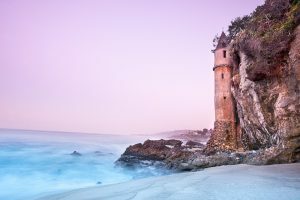 Quite a few of Hollywood’s brightest stars, such as Bette Davis, Judy Garland and Charlie Chaplain, as well as other celebrated names like President Franklin Roosevelt and author John Steinbeck, had called Laguna Beach home at one time or another. In addition to all that, Laguna Beach is a culturally rich community, counting world famous artists among its earliest settlers. The city is rife with art galleries, and hosts a famous museum and prestigious summer art festivals. If you’re looking for a primary, vacation or investment home in a community that stands out above the rest, Laguna Beach is the place for you. Laguna Beach is home to multimillion dollar waterfront properties in architectural styles that range from classic beach cottages to Spanish Colonial to Contemporary. The most significant homes are found in prestigious gated communities like Emerald Bay, Lagunita, Irvine Cove and Three Arch Bay, offering sweeping views of the ocean, private beach access, smart home features, and luxurious finishes and amenities. The north Laguna Beach area features majestic homes on high bluffs where you can get the best overlooking views of the city. South Laguna Beach is a denser community that offers the easiest access to the beach and to the downtown area. It features homes in a wide range of sizes and prices, including large estates, regular sized single-family homes, and several waterfront condo and townhome communities. If you’re looking for more affordable properties, your best bet would be the Laguna Canyon area where you can find charming homes in smaller lot sizes, as well as several condominiums. The downtown area provides classic Craftsman bungalows that go back to the community’s roots. Many of Laguna Beach’s historic arts and crafts homes can be found in Laguna Village, where they sit alongside new construction homes on exquisite waterfront locations. Laguna Beach has over 30 beaches. While some, like Emerald Bay Beach and Irvine Cove, are private, a good number are open to the public. The beaches here are as varied as the city itself. Some of the most popular beaches, like Aliso Beach, Crystal Cove State Park beaches, Main Beach and Crescent Bay Beach offer park areas where you can find picnic facilities, playgrounds, and other amenities. Other beaches, like St. Anne’s, Thalia Street Beach and Brooks Street Beach, feature well-known surfing spots. The Pageant of the Masters, featuring tableaux vivants or living pictures, which are classical artworks recreated using real people and live sets, and rendered with orchestra music, narration and other techniques to enhance the viewers’ experience. Other annual art shows hosted by the city include Laguna Art-a-Fair and Festival of the Arts. The city also hosts live performance events like the Laguna Dance Festival and the Laguna Beach Music Festival.